I get tons of great questions coming every day from so many different type of pond keepers. But just about every type of pond keeper is going to use netting on their pond at some time or another for this reason or that reason. A decision on netting needs to take a few factors into consideration. Why are you netting your pond? How long do you intend to have netting on your pond? What is your budget for a net? How are you installing the net? 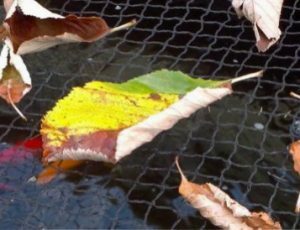 Most pond netting inquiries come during the start of Autumn when many pond keepers have to begin dealing with a sudden influx of leaves falling down. Another heavy round of netting inquiries come during late Spring when Great Blue Herons are at their height of activity and preying on our koi and goldfish. Why you are netting your pond will effect the type of netting you choose. Leaf netting needs to be pretty heavy duty stuff. We are using to nets to literally capture large amounts of falling leaf and storm debris that can weigh quite a lot dry, even more wet, and even more wet and snowy. So we want a pond net that can handle that, sorry to say but light duty bird netting from the Big Box Store ain’t going to make it (I tried, I failed, don’t you fail too). Most leaf netting will have a diamond shaped mesh weave with openings of various sizes as large as 1.25″ grading down until the weave is a tight mesh. In most cases you want a 3/4″ mesh that will keep leaves out, but still let food in. Some pond keepers will need a finer mesh if contending with pine needles, acorns, and finer materials. As the mesh becomes finer food will not pass through and some visibility will be lost into the pond as well. Most koi pond keepers and water gardeners will want netting that allows sunlight into the pond, try not to make your pond too dark. It is recommended to have netting that allows for a good amount of air circulation as well. If you are netting your pond for blue heron protection you can choose from any of the leaf netting because of their heavy duty nature but your option also broadens to include the less expensive bird netting. Yes, even the cheap bird netting can work to deter a heron and other predatory birds, but it will not deter leaves! When installing your pond netting there are several methods that can be used. Some pond keepers make “tents and domes” out of PVC structures, or DIY pond frames; while other pond keepers simply stretch a net tight across the pond just above water level. Some pond keepers let their nets kind of sit in the water not very tightly stretched, but that should be avoided for many reasons including safety of the koi, goldfish, and numerous other critters living in and visiting our ponds. For pond keepers that have high bird activity, consider leaving a corner of the pond open for small birds to escape should they get under the net. If you are netting your pond strictly for predatory bird control a full netting of the pond may not be necessary with some strategic net placement around the pond. Even an upright net barrier can work very well in keeping the big birds out of the pond area and away from your backyard 24 hour “sushi bar”. Netting materials will range with choices in nylon, polyester, polypropylene. All of these materials can be found in a variety of pre-cut sizes, or purchased in bulk as a roll. Pond keepers want to choose from these strong materials that allow for some flexibility and give. Many of the heavy duty pond nets will have grommets built in for staking down, or stretching out of the net. The pond netting material chosen should be resistant to rotting and breaking down in water; this is especially important for long term netting. A heavy duty net will also last for many years if used and stored properly. How much you want to pay for netting will absolutely effect the quality of the pond net you will choose from. Some pond nets are really cheap, you should expect cheap results from them, broken nets, and use for one season. The more expensive netting will perform with greater reliability, for a longer period of time. How much you want to invest will be directly proportionate to what you want from your net. No matter what reason you are netting your pond, one of the best options to consider is dealing with your local pond professional. Let your local pond pro guide you into the correct net to use as well as provide you with a professional installation for professional results. 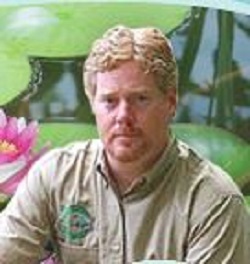 Most pond professionals will offer some sort of Autumn or Spring pond service and netting solutions for pond. They will be well equipped and well practiced for pond netting installations. Contact your local pond pro! Good luck and keep it pondy! 1 Comment on POND NETTING, WHAT TYPE OF POND NETTING IS BEST? Really it’s a big deal the sudden influx of leaves, but thanks to you for sharing this. Leaf netting can really help on this matter.